Low fences on the sides of the lake by the roads provide pleasant view for passersby, Photo: Zahedul I Khan. The six o'clock summer sun is well up in the east. Fahad, Azad and Sajna --- three siblings, whose mother sells tea to the morning walkers, are busy searching for prawns in the dirty muddy shoreline of Dhanmondi Lake. They remind one of Tagore's famous line, “achole chhakiya tara chhoto machh dhore” from the poem 'Amader Chhoto Nodi' (they catch small fish with their sarees' ends), although Dhanmondi Lake is nothing like Tagore's Little Rivulet. Yet centuries ago, during the Mughal period, the lake could have been part of a river, says renowned historian and writer, Professor Muntasir Mamum. “One side of it, perhaps, was connected to the river that flowed by the Eidgah during the Mughal period,” he assumes because one end of the lake still is visible near the Satmasjid Road Eidgah, which once stood by the dead River Pandu. 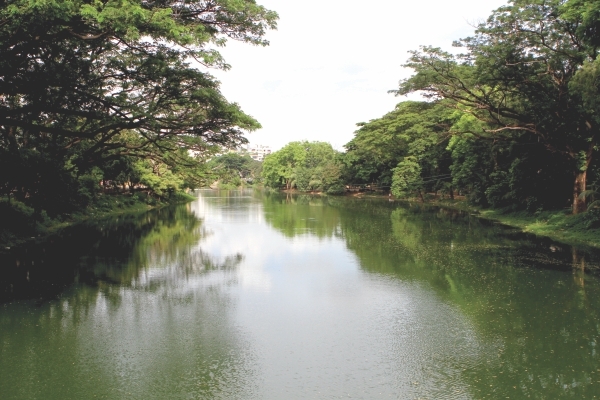 However, the present day Dhanmondi Lake was excavated during the development of Dhamnondi in the 1960s, he adds. 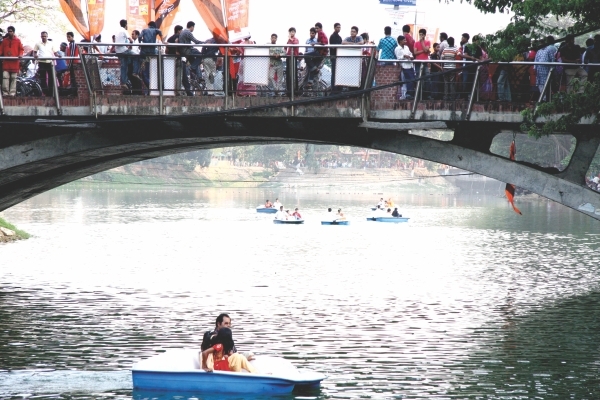 Architect Iqbal Habib, one of the chief designers of the Lake area, says that Dhanmondi Lake was one of Dhaka's largest connected water networks which in Bengali is often called nala/jheel/ khal. The name of the area has been derived from its paddy market (dhan meaning paddy and mandi meaning market), where paddy was brought by river from different areas, he explains. During 1976-77 this lake was connected to the River Balu in the east of Dhaka through the Kathalbagan and Rajabazar khal, the jheel beneath present day Panthakunja, and Airport Road, the jheel behind Sonargaon Hotel, Hatirjheel, and finally the Begunbari and Norai khal. “Even in 1977, I have seen bedenis (river nomads), anchoring their boats at what is now Russel Square,” Habib muses. The lake was almost lost due to neglect and misuse. The 1996 restoration saved it to some extent. The 85.6 acre lake area stretches from Dhanmondi Road -2 all the way to Road-27, separating the Mirpur Road from the Satmasjid Road through a 54.6 acre of water body. On the two sides of this wetland, Dhanmondi was developed as a planned residential area in the late 1950s. Chief Executive Officer of art club Bangladesh, Nahid Osman's in-laws have been living in Dhanmondi since its inception. She remembers seeing a lot of colourful flowering plants in the lake area, which was fenced by light keya trees. With increasing population, things began to deteriorate in Dhanmondi. The lake lost its connection with the other khals and jheels of Dhaka because of the box culvert construction culture of the 80s. It also became a garbage dump. “All the surface drains of Road-2, 3, 4, 5, 6 and 3A, 4A, 5A, ended into the lake. The lakeside inhabitants also connected their sewer's storm drainage pipe with the lake because they didn't want to take the trouble of finding WASA's (Water and Sewerage Authority) sewerage line. To make matters worse, the WASA itself flushed its own storm sewer line at the Kalabagan bus-stand into the lake near the corner of Road-32,” relates Habib. Fortunately, the Awami League government came to the rescue of the lake when Bangabandhu Memorial Museum was built in1996. 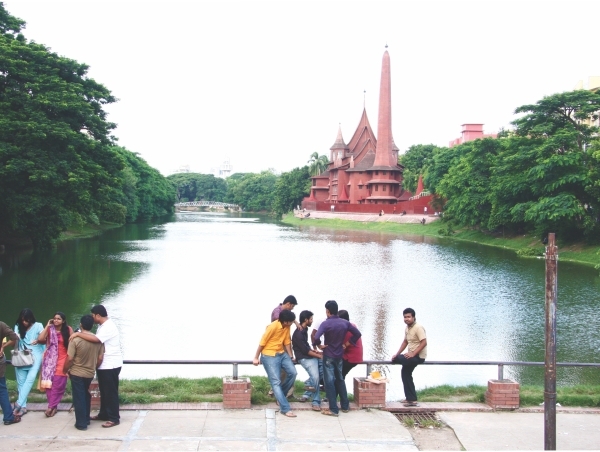 As a project of Dhaka City Corporation (DCC), the restoration of the lake was divided into three aspects --- 1) Lake Development or Restoration, 2) Lake Stewardship and 3) Lake Management under LGRD (Local Government and Rural Development) ministry, informs Habib. “We identified 97 pollution sources and 51 land grabbers and attempted to save the lake from these. 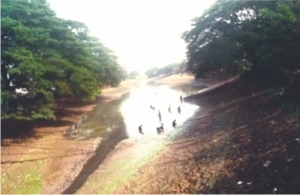 Secondly, through the proper use of tracts of land at different sides of the lake we tried to convert it from a community lake to a city lake because it is funded by the city people, not only by the community people. It is not only Dhanmondi's residents who have financed the restoration,” asserts Habib. Residents who have seen the lake before appreciates the restoration work. Jahanara Begum, who lives at Road-7A for 40 years, says, “It was a jungle before. When our Prime Minister Hasina came to power, the lake was reconstructed. Beforehand we used to walk by the road rather than the lake area. People even used to dump murdered bodies in the lake, now all those have stopped.” Neither Jahanara nor Urmee, who comes from Eskaton to drop her child at Scholar school and chat with other mothers at the open space near Rabindra Sarabar, ever faced any security problems by the lakeside. 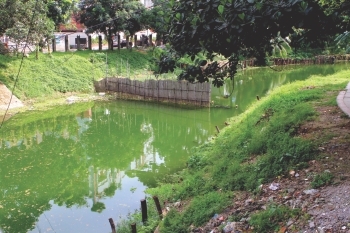 Habib's idea of converting the Dhanmondi Lake into a community lake has worked well. It not only provides respite and recreation to numerous people from all around the city, it generates its own income for security and maintenance purpose. “The entire lake is divided into eight sectors. Sectors one through seven generates income and sector eight looks after the cleanliness and security of the entire lake,” informs Md Sharif Uddin Swapan, Executive Engineer, Dhaka City Corporation. He also says that the establishments in the seven sectors like Dinghi, Sampan, Pansee are responsible for their own waste management and security. Pansee's store-in-charge, Nadim Chowdhury, confirms that they dump their waste into the vans of the local garbage carriers and use their own WASA connection for cleaning and washing purpose. Yet the lake is not clean enough. Obaidur Quader, lawmaker of the ruling party, says, “It is not being maintained properly. People are washing their clothes and bathing. Even cow, goats and dogs bathe in this polluted water.” He mainly blames the chemical waste of the numerous clinics situated in Dhanmondi for contaminating the lake water. “The lake is the responsibility of the city Mayor. But he has a partisan point of view about the lake because Bangabandhu's house is situated by the lake,” he adds. Quader also complains about the unattractiveness of the restaurants on the lake, saying their environment and food are not up to standard. Many of the residents and joggers too blame the food joints for littering and polluting the lake water by dumping their waste in it. Nahid Osman says, “In foreign countries hawkers have their own garbage bags where they keep peels of mango, onions or whatever they cut. And the rule is when you open in the morning you have to wash the surrounding place with antiseptic, and do the same when you leave.” Both Sharif Uddin and Iqbal Habib agree that the mobile food stalls near the Rabindra Sarabar are difficult to monitor. A maximum of five food stalls are supposed to be leased out there however the person responsible for leasing often sidelines the rule, informs Sharif. While fishing and angling are completely prohibited at the lake, a Kalabagan resident is found angling opposite the Kalabagan club. When reminded of the rule, he defends himself saying that as long as it is not commercial fishing it should be allowed. However Sharif Uddin opines that any type of fishing whether for commercial or recreational purpose pollutes the lake water. He says, “You may have seen some angling activities still going on by the lake, because our security is not equipped enough to stop the elite class of people who come for angling there.” At best they can make a request, he adds. By 8 am the park is swarming with guardians and parents of school children studying in the nearby schools. Mohsin Hossain Rana, who deals in cloths, sets his merchandise down at one side of the amphitheatre at Road-8. He is already surrounded by cutomers haggling prices of the fabric. “I have not taken any permission from anyone, neither do I have to pay any tolls. Usually the policemen allow us to sit here but when big shots come, we have to make a run,” he states. Sajeda confirms that some of the hawkers inside Dhanmondi Lake take permission from their supervisors to set up temporary stalls inside the park. Although the walking clubs of Dhanmondi have no restriction about using the park area for health and recreation purpose, they cannot construct any structure to aid their activities. Near Shatayu Angan, a cement monogram with “Rafiq Chattar” written on it is found broken. Mohammad Rafiq, founder of the Rafiq Chattar Shorircharcha Kendra, a health club, complains, “City Corporation has demolished this structure during Awami League regime without any reason.” He says the DCC has ordained that no private structures can be built inside the Dhanmondi Lake area other than those by the Corporation itself. Yet, clubs like Poromayu Shangha and Apanjaan, at the other side of Road-8 Bridge, have built a few exercise facilities with fund from the members. Under the new GOB (Government of Bangladesh) funded Revitalization and Renovation work of Dhanmondi Lake, already approved by ECNEC (Executive Committee of the National Economic Council), such private structures will cease to exist, informs Habib. “We will construct some exercise facilities at certain for places in the lake in a designed and planned way,” he adds. He believes that this will stop people from occupying lands inside the lake area under club banners. In fact the Tk 24,63,78,000 project will be carried out under the joint supervision of Dhaka City Corporation and Bangladesh Armed Forces and is expected to be complete by December 2012, informs Sharif Uddin Swapan. “Under this project, the Kalabagan Park will be converted into a non-mechanised children's park. We will construct 3 new foot-over bridges, extend and repair the old foot-over bridges. From Road-32 to Sampan, we will remove slush and build walkways on the sides and repair and extend the present walkways. We plan to do landscaping throughout the lake and build three new fountains. You have seen that the shoreline by Road-32 often falls apart. There we will build retaining wall,” he says. During the first phase of the lake restoration project the electrification work was left unfinished. This time Habib hopes to finish electrification and start plantation of trees as well. MD Abul Kalam Azad, Chief Executive of Dhaka City Corporation and Chairman of the management committee of Dhanmondi Lake informs about the modernisation of the lake through Wi-Fi connection and construction of storm drainage line to deal with Dhanmondi's water logging. He assures that successful implementation of the current project will breathe new life into the still waters of Dhanmondi Lake and its surrounding greenery, so that unlike Rabindranath's Rivulet, it will not vanish before our eyes.